Israeli couscous, also called pearl couscous, is similar to regular couscous, the only thing different is the shape. We import our semolina flour only from Canada, therefor our products made from high quality Wheat. While I’ve always seen it labeled as Israeli couscous, others might know it as “pearl couscous”, “Jerusalem couscous”, or, as it is known in Tunisia, “M’hammes”or ”M’hamsa .So, what does it taste like? Because of its size, Israeli couscous has a slightly chewy texture, similar to barley, and, because it’s toasted, it has a slightly nutty flavor. Like regular couscous and other whole grains, however, Israeli couscous is rather bland on it’s own, and needs to be prepared with seasonings, spices, sauces or fresh herbs. Scroll down for some preparation and recipe ideas. 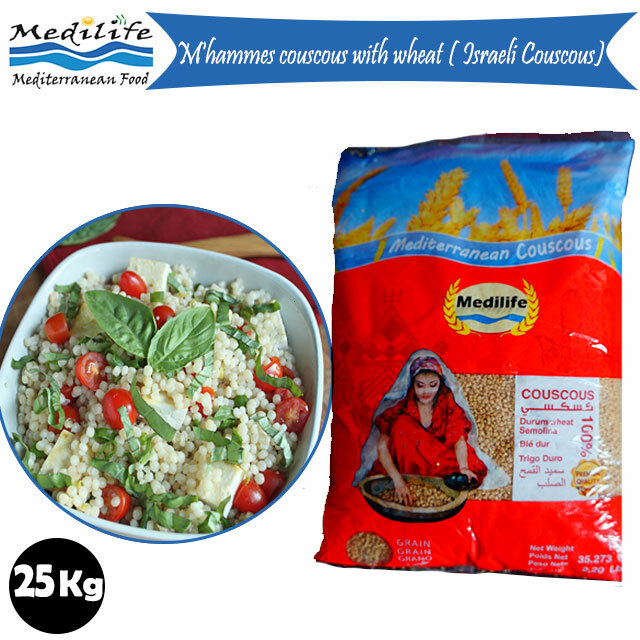 Because Israeli couscous is made from wheat flour, it is not a gluten-free food, though it is vegetarian and vegan. 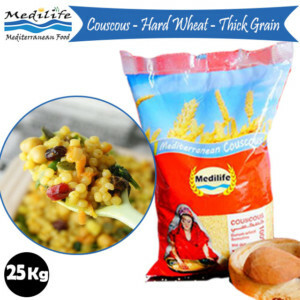 Israeli couscous also has a low glycemic index, making it a healthy and high-fiber food. 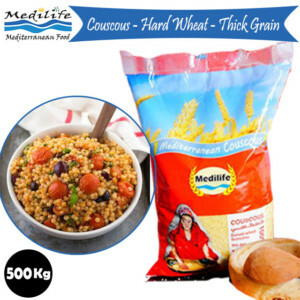 MEDILIFE Israeli Couscous the only way to discover the glory story of the most popular dish from North Africa, which is appreciated worldwide. Nowadays, people everywhere consider Israeli Couscous as ambassador of North African cuisine and the epitome of the delicacy of Mediterranean culinary art. With its rich tradition, Israeli Couscous remains one of the most attractive and mysterious dishes in the world.